The one thing humans and cats have in common is that we’re both partial to a bit of fish. What separates us is a love of 5 reel online slot games. Long story short this makes Sushi Cat the perfect online slot games for feline and sushi lovers everywhere. You can find more out about NetEnts range of games on Easy Slots online casino here. Games that centre around cats aren’t that common. The market is often dominated by Chinese, pirates and other wacky themes. But cats, cats are often overlooked. Eyecon have seemingly decided to rock the boat when they developed sushi cat. A game about a ninja cat who just loves that fishy sushi. Easy slots promotions are awesome! claim a free spins no deposit now. This 5 reel, 25 payline slot game has a distinct Japanese influence and this is owed to the fact that the game’s mean theme is sushi based. The game board is beautiful and delicate like much of the Japanese culture and artwork that we may already be familiar with. Dotted across the gameboard you will notice a range of Japanese lettering that really compliments the theme. Another feature of Eyecon’s games is that there’s always a gamble feature which means any winning the gamer does make can immediately be gambled in a double or quits scenario. It really sets the weak from the brave. Despite this we also recommend to stay within your gambling limits and game responsibly. You can also quadruple your winnings by using this feature, but that’s a different story. The format for Sushi Cat is slightly different to the way your standard 5 reel sets up. The 5 reel gameboard is vertical and operates on a slightly smaller part of the screen. 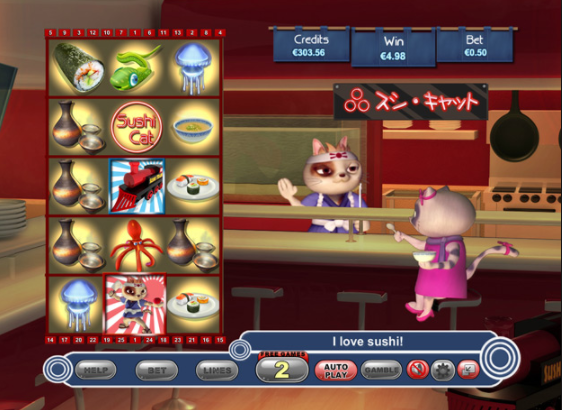 The main screen is taken up by the sushi cat taking orders in her restaurant. There’s also a handy paytable that will help you decipher what each symbol on the menu equates to. click here for the full range of Easy games. In order of value the symbols are; sushi sauces, sushi on a plate and in a bowl, a sushi roll, a green fish, a blue fish, an orange crab, a red octopus, and a blue fish lying next to a knife. Land the Sushi Cat logo in a combination with these symbols and any of your winnings will be doubled. The Sushi Cat Icon is the Scatter symbol and triggers those free spins that you have been craving. The Sushi Cat and the Sushi Train which will trigger the train and karaoke when you land three or more of these symbols across the nuanced reels. Play today to get free slots with free spins! view more. Sushi Cat is a brilliant game. A great theme always helps a slot game and this is certainly the case when you take into account this is a game that centres around a cat who runs a sushi restaurant. In addition, Eyecon offer a game that is a bit different from the rest and extremely good value for money for the customer. 10/10. 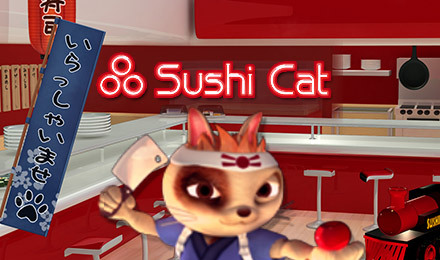 If you enjoyed Sushi Cat you might also like to visit easyslots.com for more popular slot games.